We don't usually get attached to our patients, but sometimes, there are animals that are more memorable than others. Our two sweet Spanish vets, Emma and Maru, recently spent a long time treating a tawny owl with a broken wing, and got quite fond of the cheeky little fella! The owl was brought in by RSPCA, after being found collapsed in a driveway. The bird had several small wounds on the wing and on its flank, in addition to a broken wing. Luckily, the X-ray showed that the wing was easily fixable, it just needed a splint and time to heal. 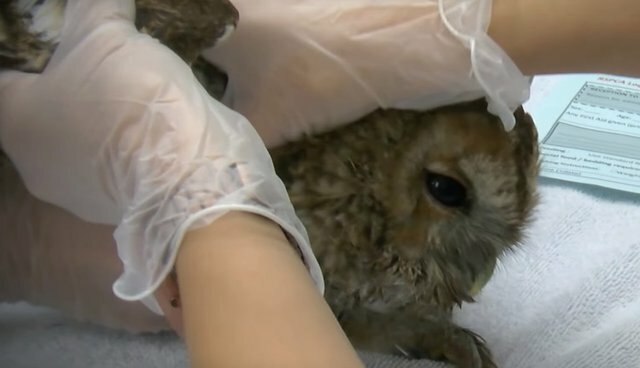 Emma and Maru took really good care of it during its stay at the hospital, enduring the clacking and clawing of this feisty owl, who clearly wanted to live! The release was an amazingly rewarding moment for the two vets, when they saw the bird flying beautifully into the night!